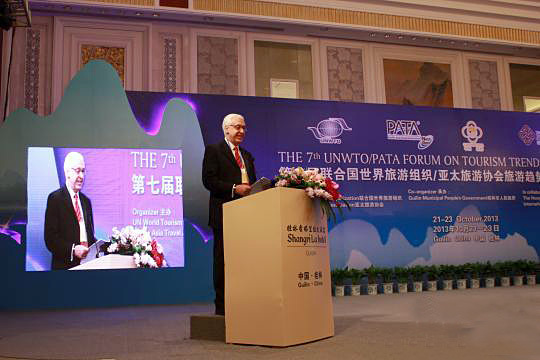 The UNWTO/PATA Forum on Tourism Trends and Outlook, organized by the United Nations World Tourism Organization (UNWTO) and the Pacific Asia Travel Association (PATA), has been held in Guilin, China, from October 21-23, 2013. Some 150 participants from 20 countries and regions attended the event. With the theme of "New Knowledge, Practices and Challenges", the UNWTO/PATA forum comprised two sessions - the technical session and plenary session. Tourism requires constant renewal and this forum gave participants the inspiration and the technical knowledge to make that renewal process happen. In 2013, the UNWTO/PATA Forum on Tourism Trends and Outlook has successfully concluded its 7th presentation. The aim in staging such a forum is to provide an annual Pan-Asia-Pacific platform for policy makers, senior officials, researchers and industry representatives to catch global & regional trends and to better understand their potential impacts on tours.